CORRECTION: An earlier version of this story incorrectly stated that uranium fuel was being loaded. In fact only graphite moderator elements are being loaded, as described below. 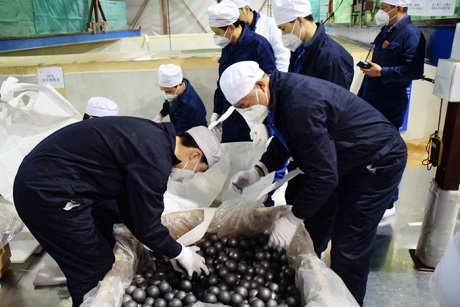 The loading of spherical moderator elements has begun at China's Shidaowan HTR-PM - a high-temperature gas-cooled reactor (HTGR) demonstration project. The unit is scheduled to begin operating later this year. The first of the graphite moderator spheres was loaded within the reactor's core on 5 April, China Nuclear Industry 23 Construction Company Limited (CNI23) announced today. In a nuclear reactor, the moderator slows the neutrons released by each fission to the right speed to trigger another, thereby enabling the chain reaction. Each of the graphite spheres is 60 millimeters in diameter and weighs about 0.192 kilograms. Later, CNI23 will load the fuel spheres, which are the same shape and size as the moderator spheres but incorporate 7 grams of uranium enriched to 8.5% uranium-235. Ultimately the reactor cavity will be filled with a total of 245,318 elements, to a depth of over 11 meters. Work on two demonstration HTR-PM units at China Huaneng Group's Shidaowan site near Weihai city in China's Shandong province, began in December 2012. The plant will initially comprise twin HTR-PM reactor modules driving a single 210 MWe steam turbine. A proposal to construct two 600 MWe HTR plants - each featuring three twin reactor and turbine units - at Ruijin city in China's Jiangxi province passed a preliminary feasibility review in early 2015. The design of the Ruijin HTRs is based on the smaller Shidaowan demonstration HTR-PM. Construction of the Ruijin reactors is expected to start next year, with grid connection in 2021. China has been actively promoting its HTR technology overseas and has already signed agreements with other countries - including Saudi Arabia, South Africa and the UAE - to consider the construction of HTGR plants. Last August, China Nuclear Energy Engineering Group signed an agreement with Indonesia's National Atomic Energy Agency (Batan) to jointly develop an HTGR in Indonesia.